As the magazine world founders, celeb chef Jamie Oliver launches a new food title. Will it succeed? 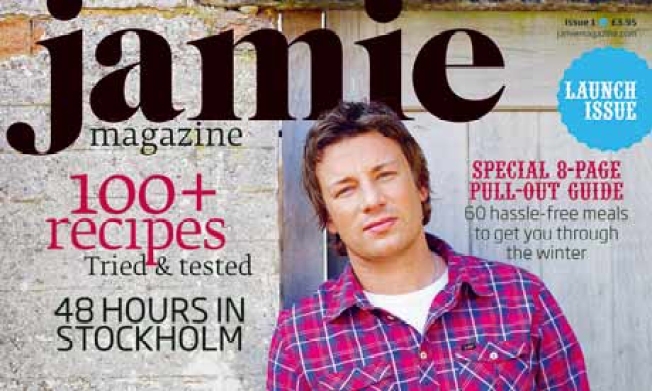 Celeb chef Jamie Oliver launches his food magazine this week. While other magazines are nixing their holiday parties, firing everybody, or just plain folding (and while New York can't even afford watercoolers for its city government staffers), apparently some people think starting a magazine -- printed on real paper, with ink and colors and everything -- is a good idea. And by some people, we mean Jamie Oliver. The scruffy Brit chef, who's becoming nearly as ubiquitous as Rachael Ray, is launching Jamie magazine, a bi-monthly that extends his carefree attitude about cooking into the print realm. The food rag's debut issue hits select newsstands this Thursday; it's stocked with about 100 recipes, but the real draw is meant to be the "personal relationship" created between Oliver and his readers, according to The Guardian. Naked Chef viewers are well acquainted with Oliver's trademark style, where he invites fans into his home and life with a casual "some mates are popping round me kitchen for tea" air -- but where his TV shows let you peer through the keyhole, Jamie magazine breaks the door down entirely: There's a column by his wife Jools, a feature on regular poker night with his buddies, a Q&A with his pal Brad Pitt (who reveals that Ang "isn't much cop" in the kitchen), and diary-style articles and lots of photos taken by the chef himself. As for the budget, Oliver sank £250,000 (about $370,000) of his own cash into the venture, which has a wee editorial staff of four and boasts a fairly green pedigree for the U.K.: it's printed "on matt paper from sustainable managed forests." Cor.